Are You Keeping Up With Vaccinations & Coggins Testing? We’re well into the summer show season, and it’s also the time of year when we’re lucky to take our horses out trail riding, or even on vacation with us! Did you know that you have to have a current Coggins test, dated within the past 24 months, to transport your horse on New Jersey’s roads (and within 12 months to other states)? Warm summer weather also brings with it pesky insects like horse flies and mosquitoes which can put horses’ health at risk if they have not had their annual spring vaccinations. Remember it is still not too late to have your horse vaccinated against things like Eastern, Western, and Venezuelan equine encephalomyelitis and West Nile Virus. 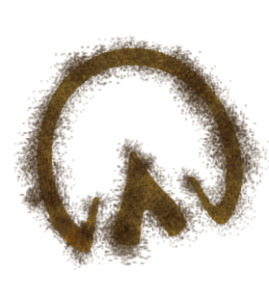 We are in peak fly and mosquito season right now! that are included as part of the resource kit. The Coggins test is a simple blood test to determine the presence of Equine Infectious Anemia (EIA). EIA is a non-contagious but potentially fatal virus. According to the USDA’s Animal and Plant Health Inspection Service, symptoms of EIA can be non-specific, and include fever, weight loss, lethargy and anemia. EIA is a blood borne disease, and is typically spread between horses by biting insects, such as horse flies and deer flies. The Merck Veterinary Manual notes that EIA can also be transmitted though contaminated needles, syringes, surgical equipment or infected blood transfusions. There is no treatment or vaccine for EIA, so surviving infected animals must be kept at least 200 yards from non-infected animals until they test negative for EIA. The American Association of Equine Practitioners (AAEP) recommends a series of “Core” vaccines that each horse should receive annually. For adult horses, these include tetanus, Eastern & Western Equine Encephalomyelitis (EEE/WEE), West Nile Virus (WNV) and rabies. 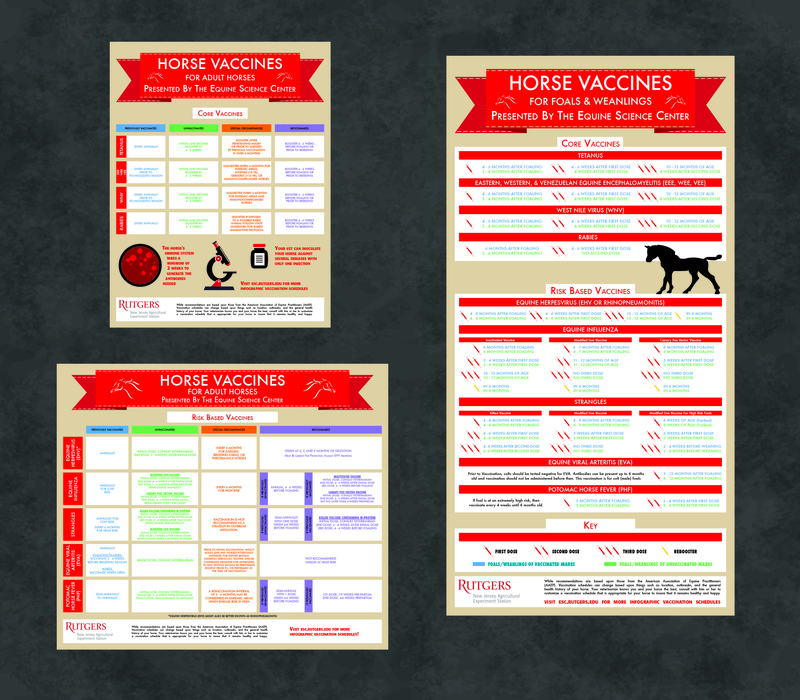 Additional vaccines are recommended based on a horse’s risk factors. 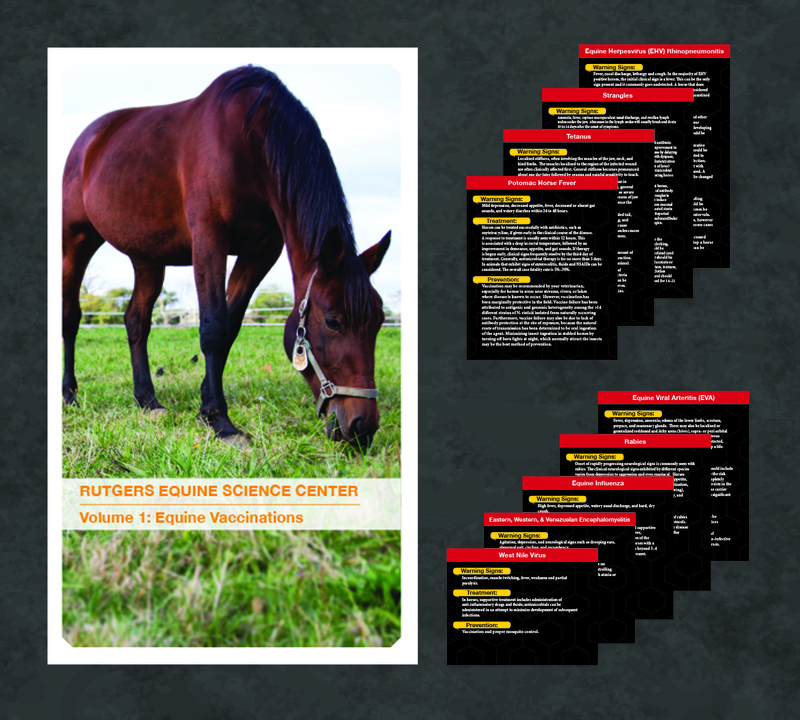 Similar vaccines are recommended for foals, but the intervals for inoculation are different. Diseases like West Nile Virus can be spread by mosquitoes. Mosquitoes travel, even if your horse doesn’t, which is just one reason why a simple vaccine is worth the investment. (17″ x 33″), pictured on the right, are available separately. Basic vaccinations should always be kept current, regardless of how much a horse moves from location to location. When bringing a new horse home, be sure the horse has a current negative Coggins test and is up to date on vaccinations. If you’re buying a new horse, a negative Coggins test dated within 90 days of purchase date is required as per New Jersey state law. Make it a priority to talk to your veterinarian about regular testing and the best vaccine schedule for your horse. The Equine Science Center has created a vaccination kit that makes it easy for horse owners to understand vaccines and the diseases that can put horses at risk. Order the kit here. Join Us For Our Summer Showcase!